If you’ve ever tried to send a really large file over the Internet, you know that it is quite a frustrating task. There are two popular ways to do it: either by attaching the file to an e-mail or by uploading it to a file hosting website. The problem is that both impose a strict size limitation for uploads, usually 25 MB for e-mail or a couple hundred MB for file hosting websites. The problems don’t stop there, since having an unreliable connection, such as Wi-Fi, means that you can upload 99% of your file and then have the connection break, making you upload the file all over again. If you need to send a file bigger than a few GB, you will soon realize that it is nigh impossible to do. However, there is a solution. In this article, we will take a look at file splitters that can be used to break a file into small parts and file joiners, which can then put them together on the other end. These programs help you neatly circumvent both problems, as you can create parts smaller than the upload size restrictions. Also, if the connection breaks, you just have to upload the latest part, instead of the whole file. This is a very simple program that doesn’t require installation. Merely extract “hjsplit.exe” from the archive and double click on it to launch the program. HJSplit can generate MD5 checksums, which are unique to any given file and can be used to determine if the file has been tampered with. These checksums come in the form of 32-digit numbers. The sender can generate a MD5 checksum of the file and send both to the recipient. Upon receiving, the recipient calculates the MD5 checksum of the received file and compares it to the sent checksum. If they match, the file arrived intact. Otherwise, it was probably corrupted due to interrupted upload. 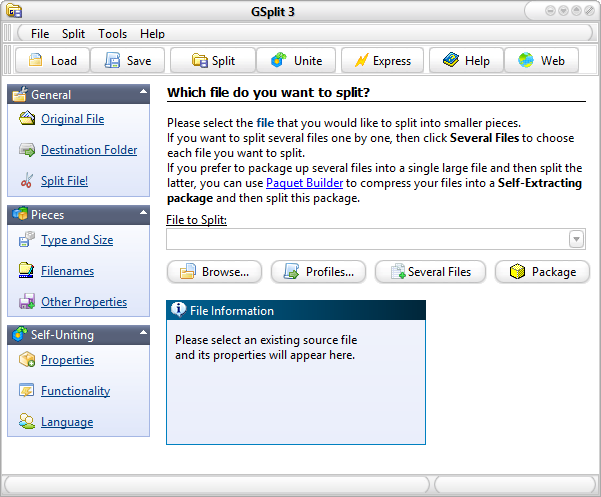 To split a file, click Split then click Input File, select the file and click Start. The resulting parts will be numbered and can also be joined by FFSJ, because they use the same joining and splitting algorithm. When joining parts of a file that already exists in the same folder, HJSplit will append JOINED to the duplicate file name. Other than that, HJSplit can compare the size of any two files and give you the answer if they are the same or not. When creating an archive, you can split it into parts and specify the size, in bytes, of a single part. Remember that roughly a million bytes represents a megabyte, so make sure you do the math right, or you might end up with thousands of file parts in your folder. The resulting files will be named “.part01.rar”, “.part02.rar” and so on. When you want to join them, simply put them all together into a single folder and open any of them with WinRAR. Besides that, WinRAR also has the option of creating recovery volumes and a SFX module. Recovery volume is a way to protect your archive from loss or damage, since it adds a backup that acts like a “joker card” and can replace any one missing part. You can specify how many of these you want to create by going to Advanced tab of the creation dialog. SFX, or a self-extracting module, can be added during archive creation by clicking Create SFX archive and it will automatically extract the archive to specified path, which can be set to absolute or relative. 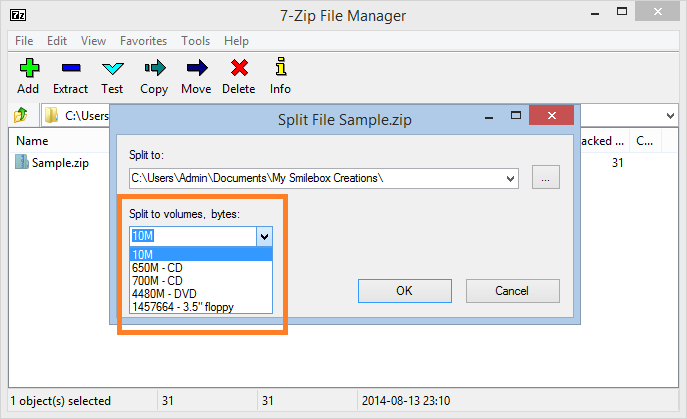 When you run 7-Zip, you will be greeted by the main window, similar to Windows Explorer, where you can navigate folders and choose files. 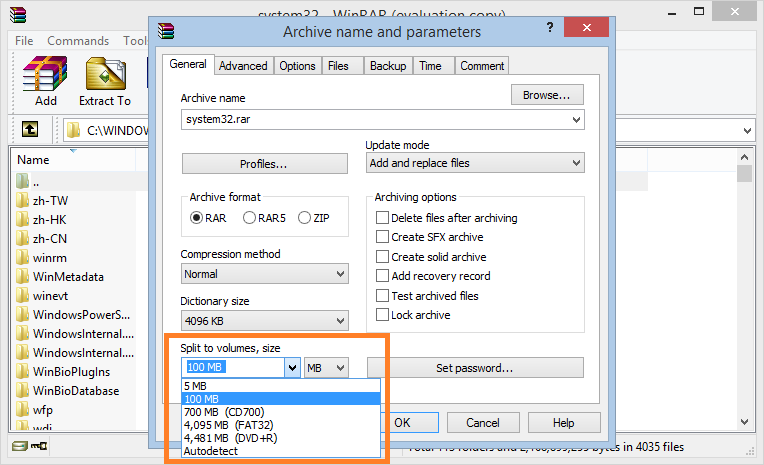 Choosing a file and clicking Add will open the archive creation dialog where you can specify the byte size of parts, similar to how WinRAR does it. Overall, 7-Zip is comparable to WinRAR in all aspects, but has slightly more varied options which are presented better. One positive side of 7-Zip is that it won’t force itself as a sole archiver on your computer. Even when it creates .7z archives, which are its own format, it will still keep your original archiver program as a default choice for opening them. If you decide you like 7-Zip more, you can always go to Tools and click Options to associate it with as many archive formats as you wish. FFSJ can’t create archives, it can only split files and join them for easier storage and upload, with the added benefit of calculating MD5 checksums. Note that if a file is password protected, it is not possible to gain access to the original file without the password. Splitting the files separates them into any number of files with a numbered extension, such as .001, .002, and so on. FFSJ’s interface is overall very pleasant to work in. FFSJ is available in two versions – Lite and Standard. FFSJ-Lite is a portable application that doesn’t require installation and can be carried around on a USB stick and used in environments where you don’t have administrative privileges. Standard version integrates itself with the Windows Explorer and adds its options to the right click context menu for easier access. FFSJ is compatible with HJSplit and can join files created by it. This is hands down the best splitter and joiner program of all tested in this article. It has a particularly interesting feature, called SFU, or Self Uniting, which creates the first part of the split file as an .exe. This .exe can be executed to automatically unite all files, which means that the recipient doesn’t need to have GSplit or any other joiner program to restore the original file. SFU also makes it possible to define a custom welcome message, dialog boxes, destination folder and picture header. Although GSplit has the option for changing the default file naming convention, it unfortunately doesn’t work, which means that the file parts you create will always be named “disk1.gsd”, “disk2.gsd” and so on by default. You can only change these names by hand, which is extremely tedious.